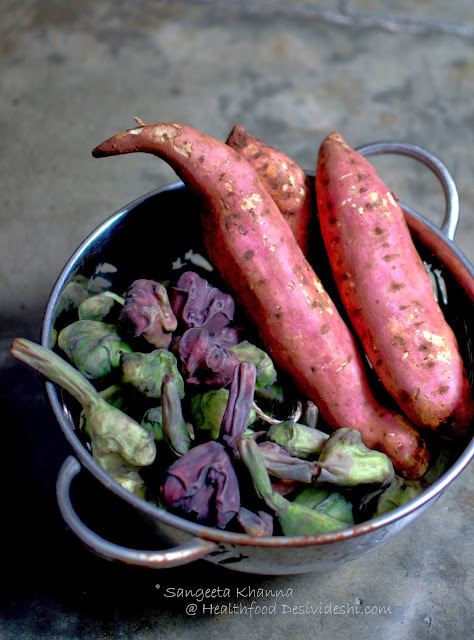 Sweet potatoes and water chestnuts both are in season and we are loving it. Interestingly, I love sweet potatoes more and Arvind loves water chestnuts more, so much so that he sits with a bag full of water chestnuts watching TV and peels a couple of kilos late in the night so he can have it for breakfast the next day and some salad during the coming week. He loves it most the way I stir fry it with just salt and pepper in ghee. But then he loves water chestnuts so much he can have it in other preparations as well. Sweet potatoes he normally doesn't eat unless I toss up an interesting salad with it. This salad with sweet potatoes and water chestnuts was quite interesting with a balsamic and honey dressing. We have already repeated four times with minor variations in the dressing since I made it the first time. I love the way boiled water chestnuts taste in a salad with varied textures and how well boiled sweet potatoes soak up flavors from whatever dressing you use. Water chestnuts do not soak up much flavors, but provide a good crunch and a nice dimension to overall flavors. Peel the cooked sweet potato and cube in bite size pieces. Indian sweet potatoes are pale and don't look as vibrant as in the temperate countries but they are full of flavour. *Cook (microwave or boil) the water chestnuts if they are tough, use them raw if they are sweet and tender. Keep aside. Take a large salad bowl and mix the honey, balsamic vinegar, salt and pepper, lime juice and give it a good stir. Add the onions and basil, mix. Now add the sweet potato cubes and water chestnut halves along with chopped almonds and pine nuts into this dressing, mix well to coat evenly. Check seasoning and adjust. Crumble feta cheese over it, mix lightly and serve right away. 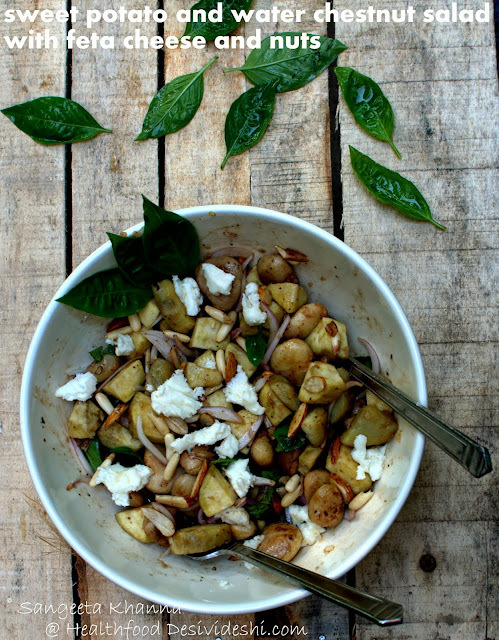 The flavors in the salad are so varied with salty feta, sweet potatoes, crunchy sweet water chestnuts and the nuts. Basil and onions add a new dimension. I added sweet lime juice the other day and it was equally yum. I think some orange juice will be great too. Try this salad while the season lasts and let me know if you liked. You can always adjust the ingredients of this salad to make it a navratri fasting recipe. Skip onions, use pink salt and paneer cubes instead of feta and your fasting meal is ready. sweet potatoes and water chestnut salad with honey balsamic dressing and feta..
What interesting flavours and textures. I need to graduate from just eating raw boring singharas!